The HTC 10 is powered by a Snapdragon 820 CPU with two Kyro cores clocked at 2.15GHz & two Kyro cores clocked at just 1.6 GHz. The Snapdragon 820 is the first CPU for which Qualcomm finally decided they didn't need more cores but better ones. The new chipset is paired with generous 4GB of RAM and a dedicated Adreno 530 GPU for graphics. Indeed, a single Kryo core is a beast, and currently it's one of the best solutions on the market together with Apple's Twister CPU. The single-core performance is crucial for smooth OS operations, and the Kryo cores are up to the task. The multi-core score isn't as impressive, because there are only four Kryo cores inside the Snapdragon 820, while the Kirin 955 in Huawei P9, or the Exynos chip inside the Galaxy S7 feature octa-core processors. Still, considering the number of cores, we could easily consider those points as an excellent grade. The HTC 10 easily aced the AnTuTu 6, and it bested the rest of its siblings by a huge margin. Since the HTC 10 has similar hardware to the LG G5, we guess some software optimizations are the reason for the great performance. The BaseMark OS II compound bench outed an oddly low score, which makes us believe there might be some problem with the app itself and the new Sense UI. We'll redo this test when possible. HTC 10 uses the latest Adreno 530, which is the best GPU on the market right now. The off-screen GPU benchmarks below prove that. Running the GPU test on the native 1440p resolution takes a serious toll on framerates, but they remain flagship-grade. The Mi 5, which has the same GPU but runs on 1080p, expectedly does better here. In the BaseMark X GPU test the HTC 10 scores on par with its chipset sibling - the LG G5. The HTC 10 scores speak for themselves - the new flagship delivers a stellar performance, and we expected nothing less from a Snapdragon 820 smartphone. 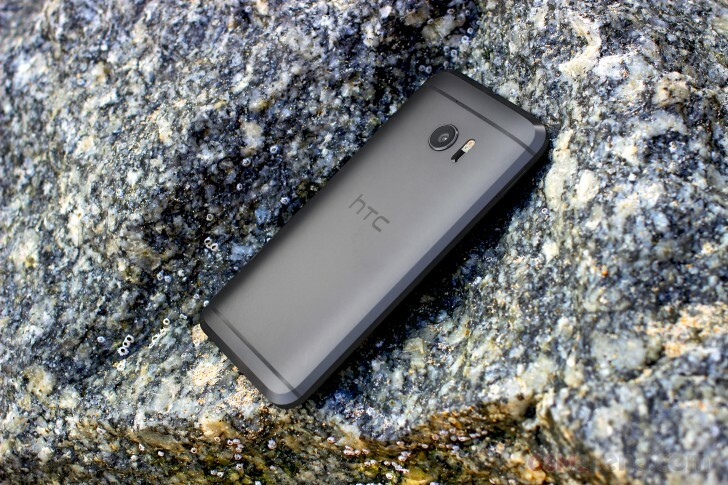 The chip is sure to serve the HTC 10 hassle-free for the years to come. The HTC 10 uses the more conventional Embedded Multi-Media Controller (eMMC) 5.1 NAND memory, which, when compared to Samsung’s Universal Flash Storage (UFS) 2.1 NAND, is significantly lower in read/write performance than the newer UFS 2.1 standard of flash memory. The Samsung Galaxy S7 edge and the LG G5 both use this UFS memory. 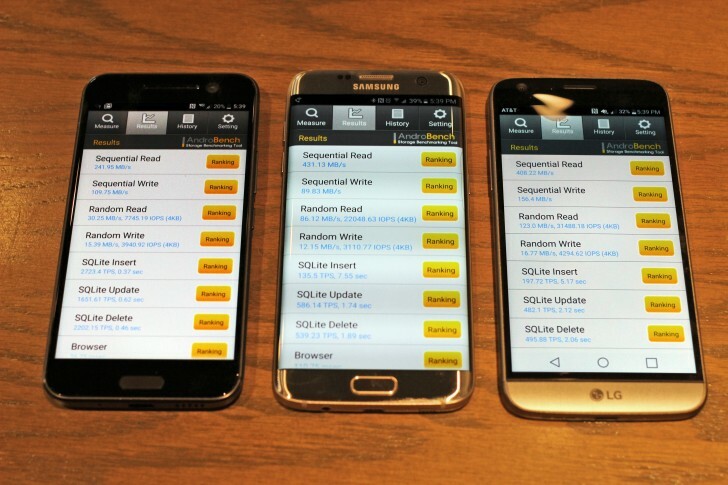 We ran the popular memory Benchmark AndroBench in order to find out just how the three flagships compare in 4 different memory tests: Sequential read (which measures the speed of reading a single file), sequential write (measures the speed of a single file being saved onto the memory), random read (speed of memory when reading data from multiple locations at once), and random write (speed of writing to multiple locations at once). These tests help to determine how the phones might perform under certain conditions and explains why a phone often slows down when there are too many background processes performing work all at once. These sequential read numbers clearly show how much faster the new UFS memory technology is when compared to the eMMC 5.1 standard found in the HTC 10. The HTC 10 yielded 44% slower results than the Samsung Galaxy S7 edge did in this regard. The HTC 10 runs right in the middle of the other two flagships in the sequential writing test. The highest scoring device in this category was the LG G5 at 156.4 MB/s and the lowest was the Samsung Galaxy S7 edge at 89.83 MB/s. Sequential writing is performed when transferring a file from one folder to another, for instance. In the random read test, the HTC 10 performed much slower than the other two flagship devices. While random performance is dependent on a number of factors, the phone would still be significantly faster if it had UFS type storage instead of eMMC. The random reading speed of the HTC 10 was 30.25 MB/s while the LG G5 and Galaxy S7 edge both scored 123 MB/s and 86.12 MB/s, respectively. The HTC 10 came up second in the random write speed tests. However, these flagships are pretty close to each other when it comes to this test. We wouldn’t want our readers to get the wrong message. The HTC 10 is still blazing fast in every day performance. UI, launching apps, and such are all still exceedingly snappy for day to day. However, we just want you to know that if you really did want to get a phone that works faster in this aspect, you have a couple of other choices.